I’m excited to share that the dates for Coming Back Together (CBT) 2017 have been set for September 14-17. Although CBT is held just every three years, it is one of my favorite campus-wide events. It is inspiring to see African American and Latino alumni come back to campus to celebrate their accomplishments and experience the growth and change the University has undergone as a champion of diversity. Syracuse University first hosted CBT in 1983. It was the first reunion of its kind in the nation. CMT 2014 was one of my first events as Whitman’s executive director of alumni and corporate relations, and I have fond memories of that weekend. I was extremely impressed by the loyalty and strength of connection to SU exhibited throughout the weekend. This is a group of energetic and accomplished people who believe wholeheartedly in the value of education and who want to create a significant and sustainable scholarship program to help African Americans and Latinos attain the advantages associated with a college education. The CBT 2017 weekend features a full schedule of distinguished speakers, networking, social, cultural, service and academic events, as well as the gridiron match up of the Syracuse Orange football team versus Central Florida. Whitman will host a luncheon from Noon – 2pm on Friday, September 15, with our CBT alumni and African American and Latino students. I am looking forward to welcoming many of our graduates back home. If you’ll be returning to campus for CBT 2017, please email me at csadams@syr.edu with your plans. If you are considering making the trip, I strongly encourage you to do so. I promise you won’t regret it! 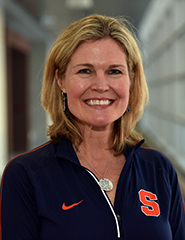 Cindie Adams is the executive director of alumni and corporate relations at the Whitman School of Management at Syracuse University. She has extensive expertise in academic program development, career advising, managing boards and teams, and higher-education admissions. She has also worked in global marketing for a consumer products company and in export sales. Adams holds a B.A. in economics, political science, German and international relations as well as an MBA and an M.S. in counseling psychology, all from the University of Wisconsin-Madison. With her husband, Jim, she enjoys spending time with their four twenty-something children, traveling the world, and taking on any fitness and adventurous challenge.